(a) If it's daylight savings time (from the second Sunday in March to the first Sunday in November), add an hour to the sundial time. 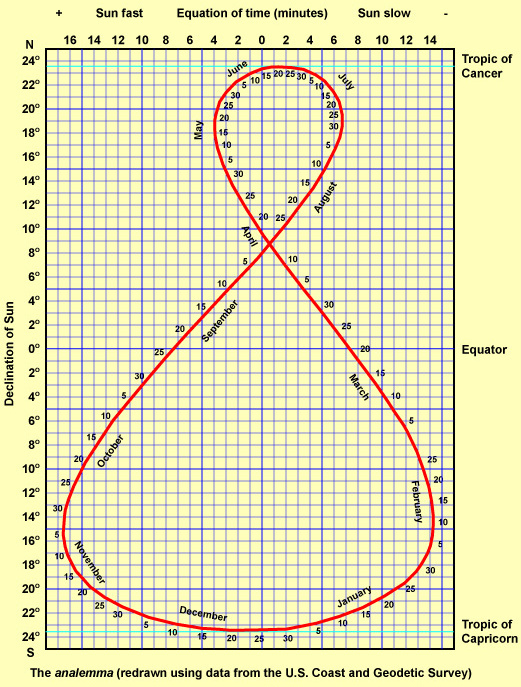 (b1) Determine your latitude and longitude. To do that, use a GPS device, or in Google maps, right click on your location, click on "What's here? ", and your latitude and longitude will appear. 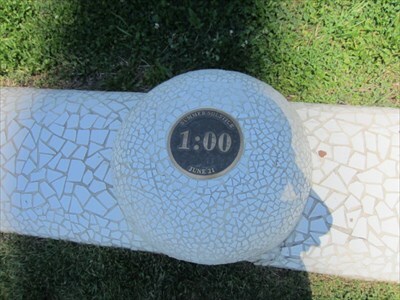 For the Ingleside Terraces (IT) Sundial, they are 37.725 and -122.47 degrees. (b2) The center of the time zones (clock time) are spaced at 15 degree intervals, i.e. 0° (GMT), -15°, -30°...-105°, -120° (PST and PDT). IT is 2.47° west of the center of our time zone, so our suntime is 60x2.47/15, approximately ten minutes earlier than our clock time, so ten minutes must be added to the sundial time. (c1) A correction must be made for the "equation of time", which is due to the fact that the earth does not travel around the sun at a constant speed. When the earth is near perihelion (closest to the sun, around January 3), the speed of the earth's revolution around the sun increases, solar noon appears later each day, and up to 15 minutes needs to be added to the sundial time to obtain clock time. After aphelion (farthest from the sun, around July 4), up to 15 minutes needs to be subtracted to the sundial time to obtain clock time. (c2) Around the equinoxes, March 21 and September 21, as the sun crosses the equator, suntime gets faster compared to clock time. (d) The diameter of the sun as seen from the earth is about 0.5 degrees. As there are 15 degrees longitude per hour, this means that the shadow from the east side of the sun is about two minutes later than the shadow from the west side of the sun. This limits sundial accuracy to about a minute or two. (e) From September 27 to October 2 and from December 1 to December 5 in Ingleside Terraces, the corrections for longitude and for the equation of time cancel each other, although in September and October one hour must still be added to sundial time to obtain daylight savings time. (f) "Leap seconds" were not used until 1972, which could make 1913 sundial time about a half minute behind clock time. The 217 foot pylon is aligned pointing due north but is not a true sundial, as the pylon is angled approximately 49° from the horizontal, as can be seen in the photograph below. The base of the gnomon is located at latitude 40.593, longitude -122.3775. To function as the gnomon of a sundial, the pylon's angle should equal the bridge's latitude, so that the gnomon is parallel to the earth's axis. 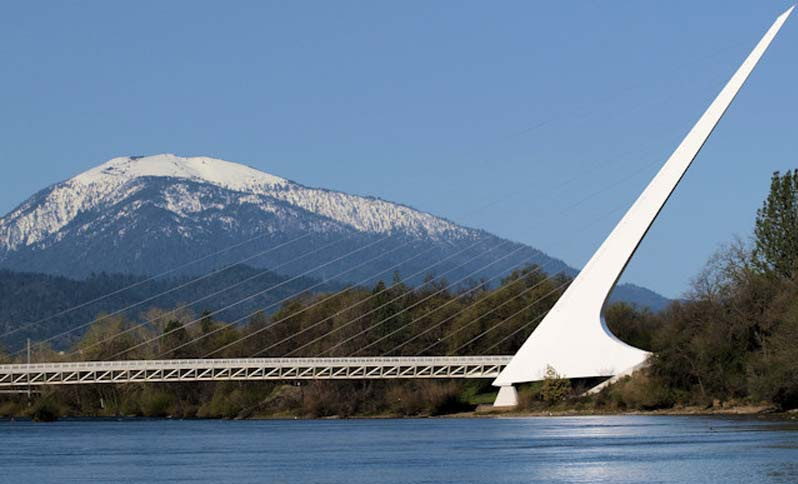 The Sundial Bridge is stated to be "exactly accurate on only one day in a year - the summer solstice, June 20 or 21." The markers on the dial are positioned for Pacific Daylight Time on June 21. Solar noon on June 21, 2018, for this location is at 13:11:23, at which time the sundial shadow points due north. 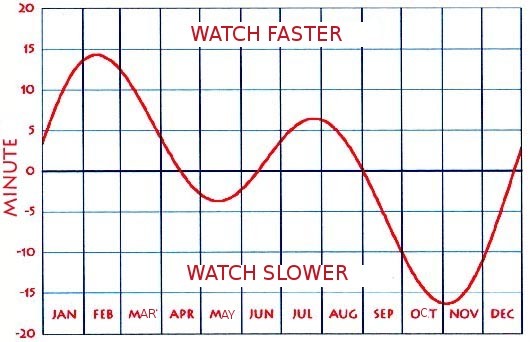 The equation of time (shown above) doesn't exactly apply due to the angle of the gnomon, but Sundial Bridge time would be expected to be accurate compared to clock time four times a year: beginning of April, June 20-22, end of August, and end of December if an hour is subtracted to obtain Pacific Standard Time. NOAA Solar Calculator However, the Sundial Bridge does not have precise markers and the shadow of the gnomon is wider than the markers, so time cannot be read accurately using the Sundial Bridge.